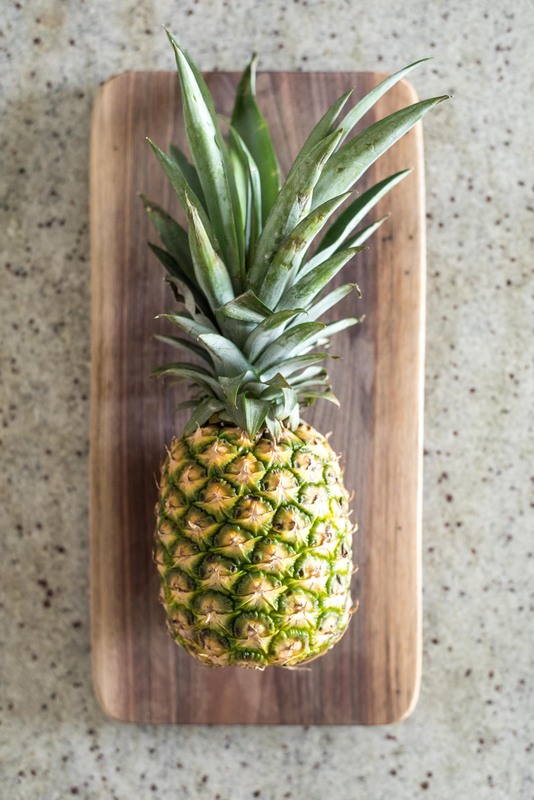 Color: Typically the greener a pineapple is, the less ripe it is. 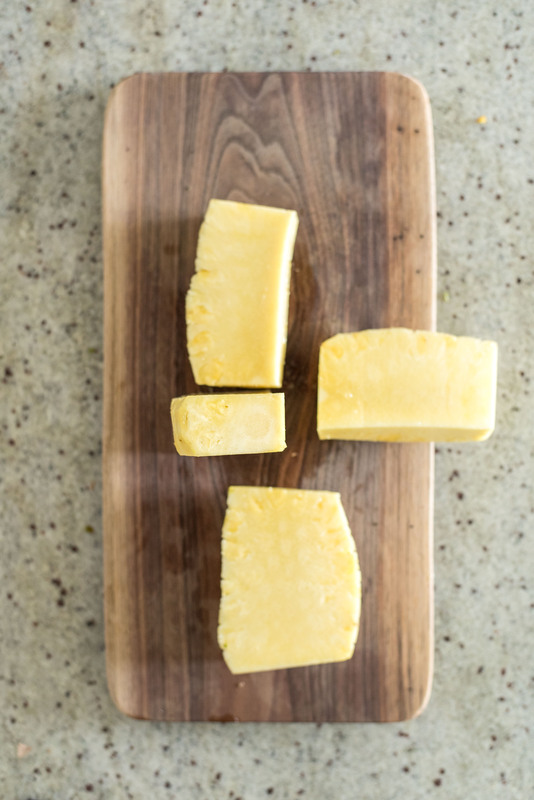 So, the yellower the better. 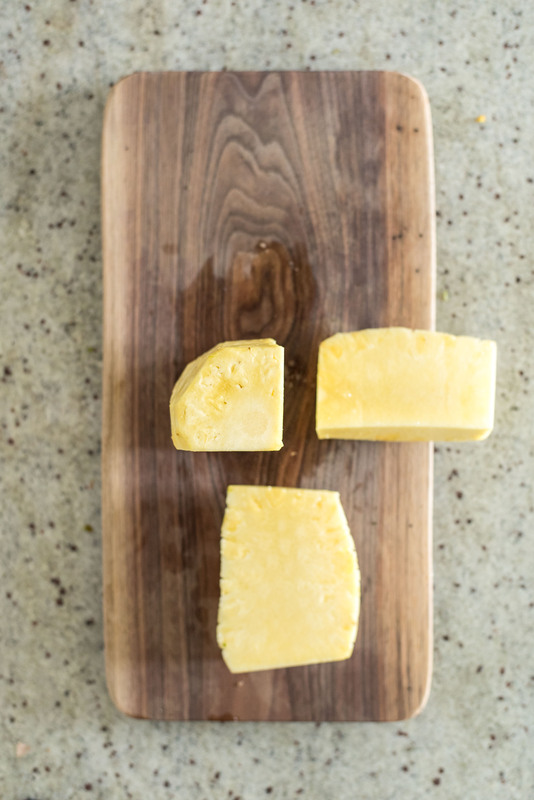 You can let it sit on your counter for a few days if it’s not as yellow as you’d like, but they don’t ripen significantly after they’re harvested. 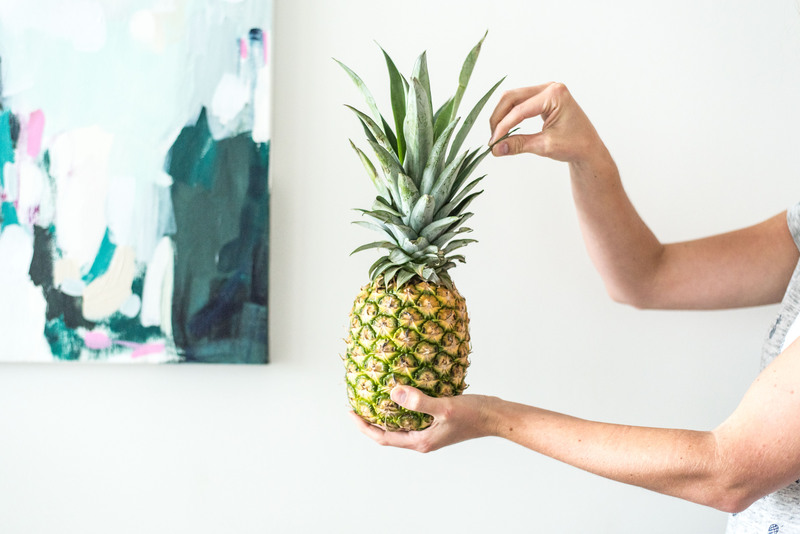 Smell: Pick up a pineapple and sniff it! 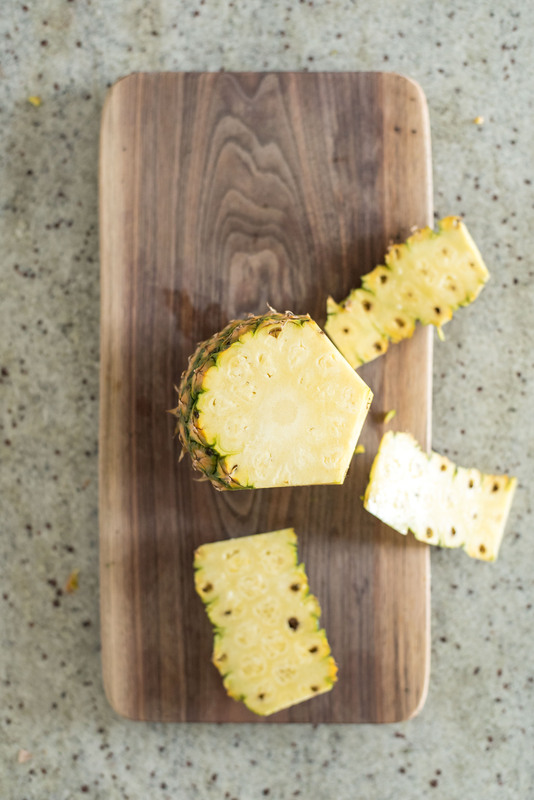 You should be able to smell a sweet, pineapple-y scent coming from ripe ones. The leaf test: If all else fails, you can use this simple trick that my mom taught me. 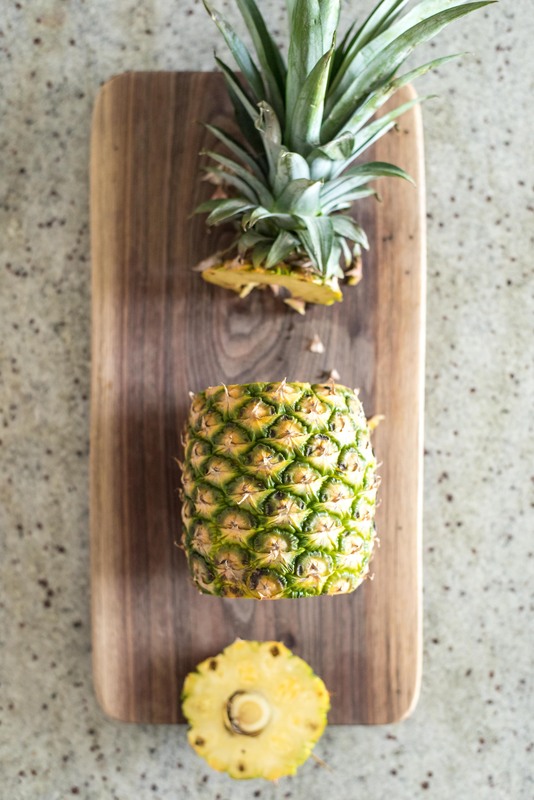 If a pineapple is ripe, you should be able to easily pull out one of the leaves on top (try one in the top center). 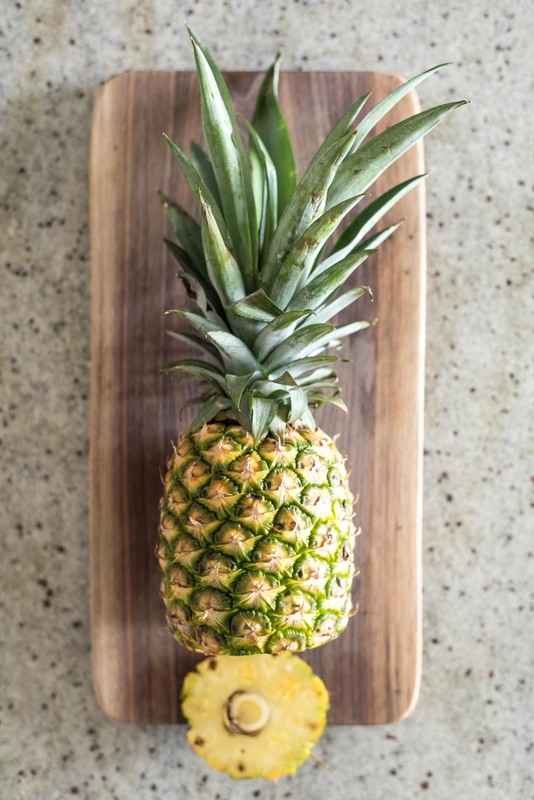 You might notice a small pile of pineapple leaves in the grocery store from other people who know this trick. 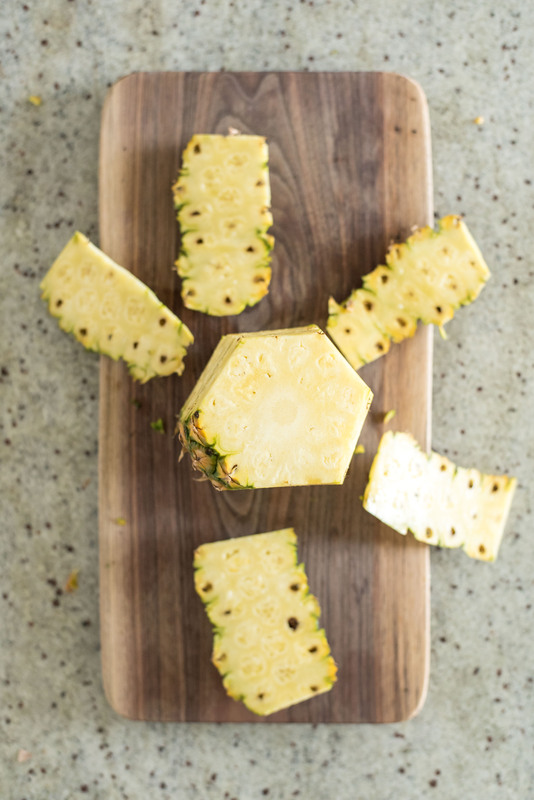 There isn’t one correct way to cut a pineapple; this is just an example of how I like to do it. 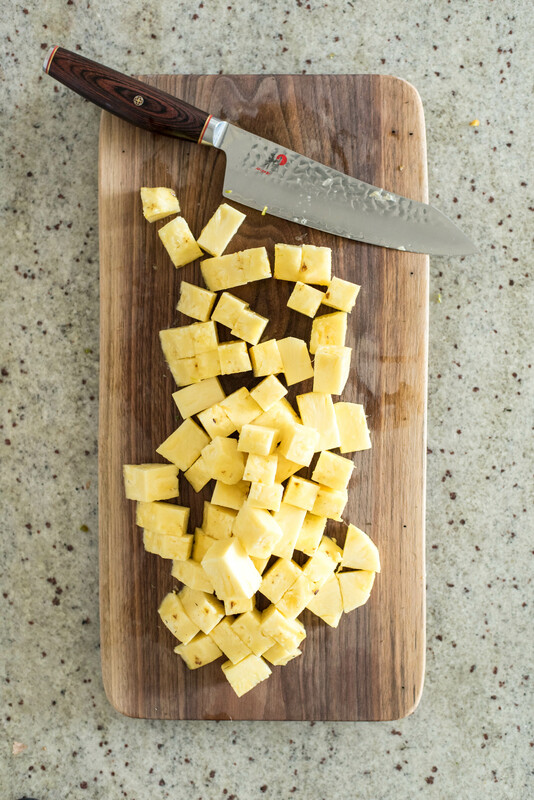 You’ll need a cutting board and a sharp knife. 1 – First, cut off the top and bottom. 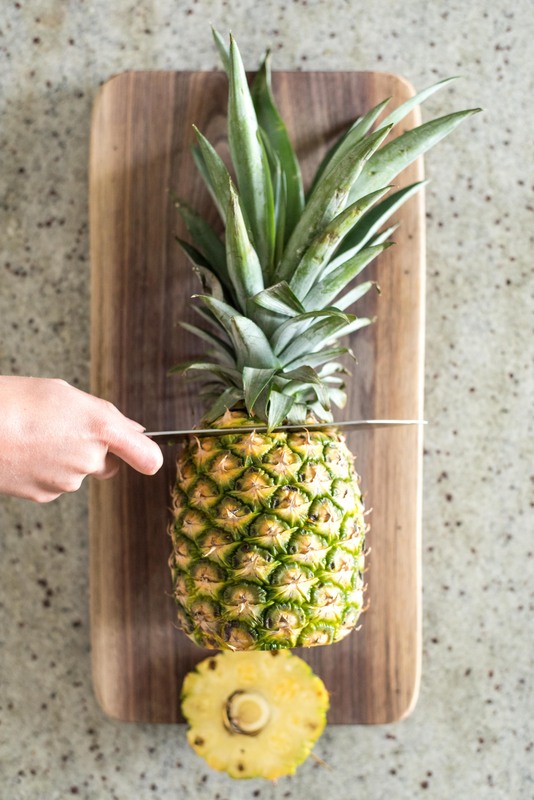 2 – Set the pineapple on one of its cut ends. 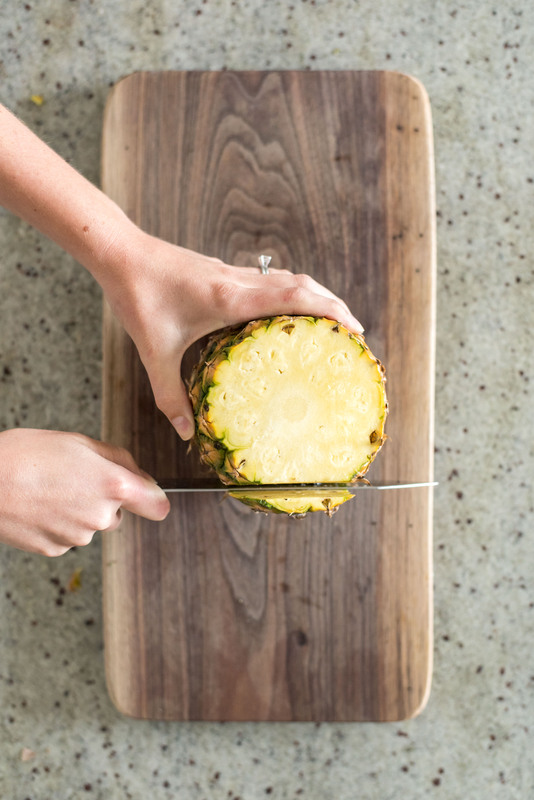 Slice down the side, following the slight curve of the fruit. It’s ok if you don’t get all of the little spurs off yet. 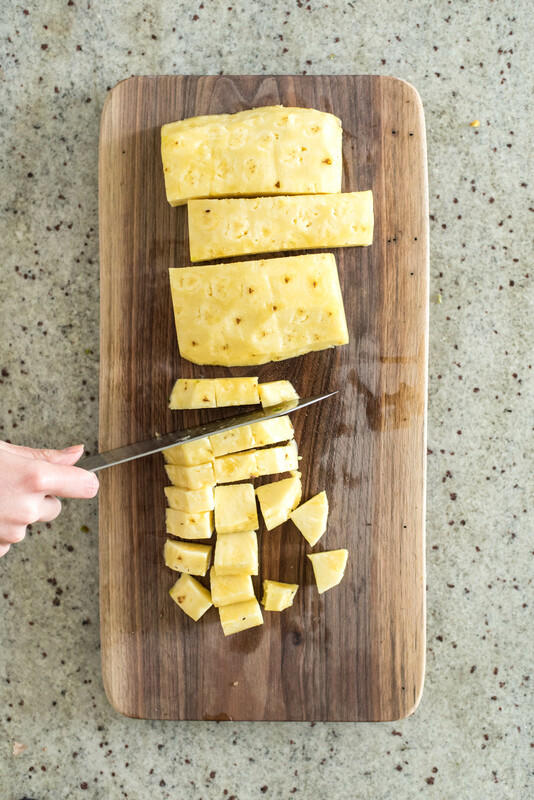 3 – Repeat, slicing around the entire pineapple. 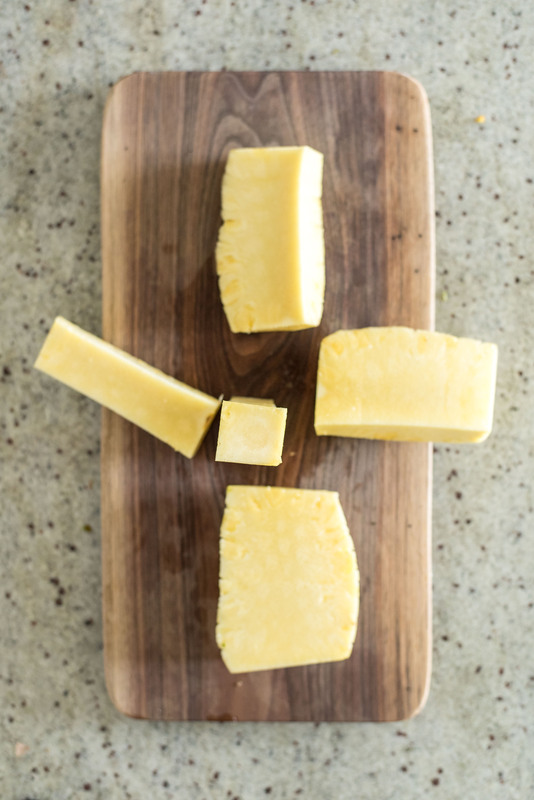 4 – Go back over and cut off any remaining portions of the rind or little stickers (you definitely don’t want to eat those). 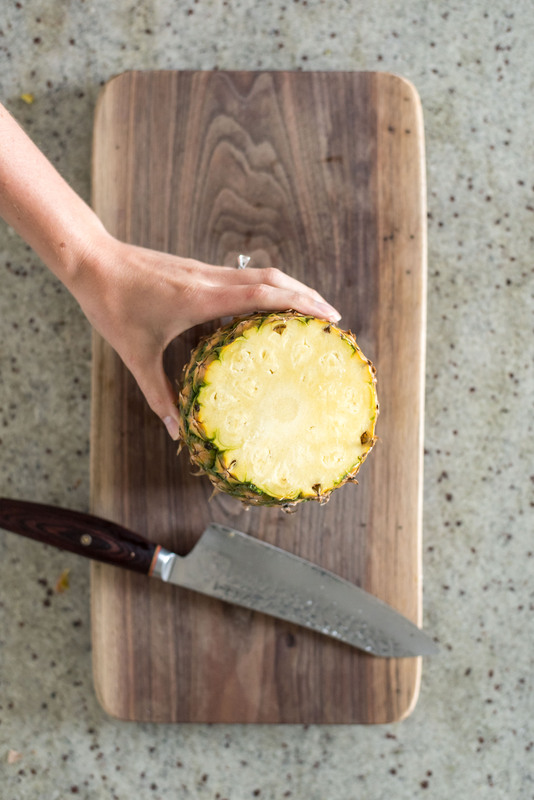 5 – Now, slice along the core (the lighter colored circle in the center) to remove a portion of the fruit. Turn 90 degrees and repeat until you’re left with the core as a square column. 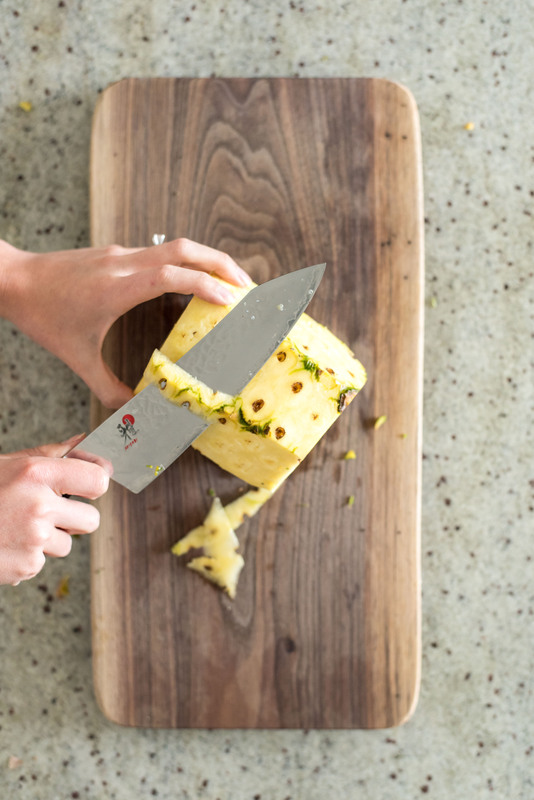 6 – Depending on how you plan to use the pineapple, there several different ways to cut up the final product. 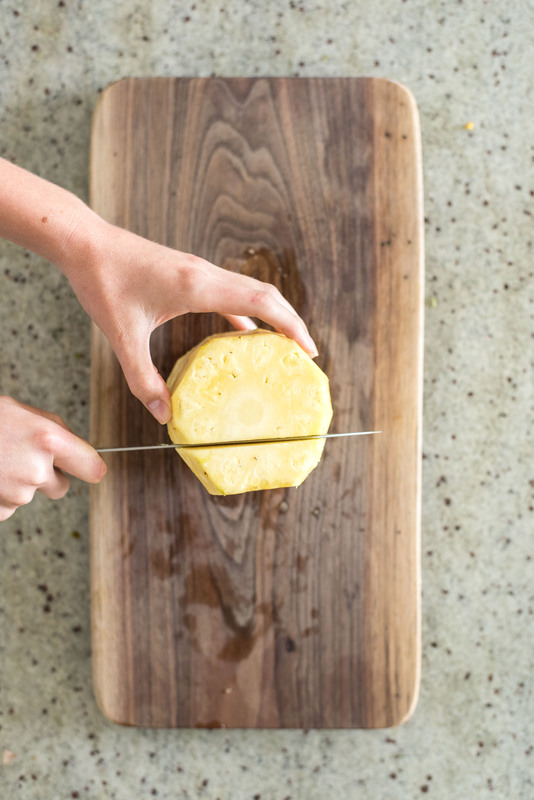 One way is to cut slices lengthwise into spears. 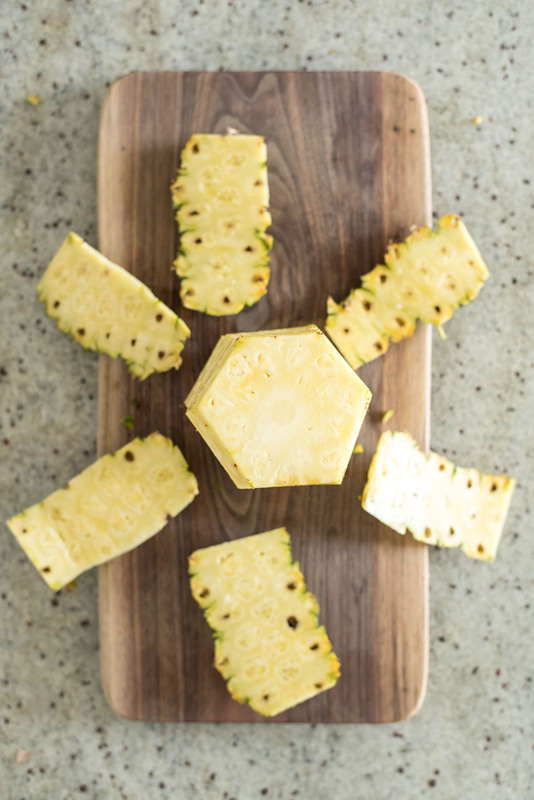 They’re great for grilling, serving on a platter, cutting into smaller chunks, or using in a juicer. 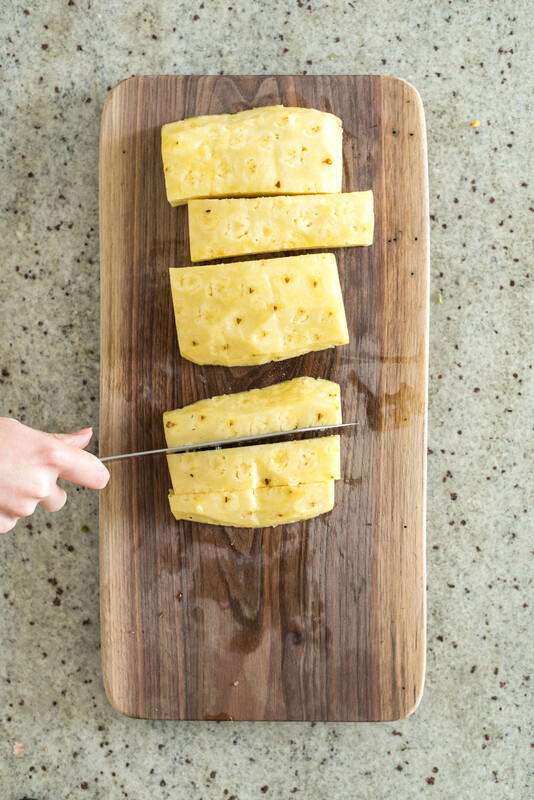 You can cut those spears into 1/2″ wide pieces that I like to call “tidbits” (similar to one of the ways you can buy canned pineapple). 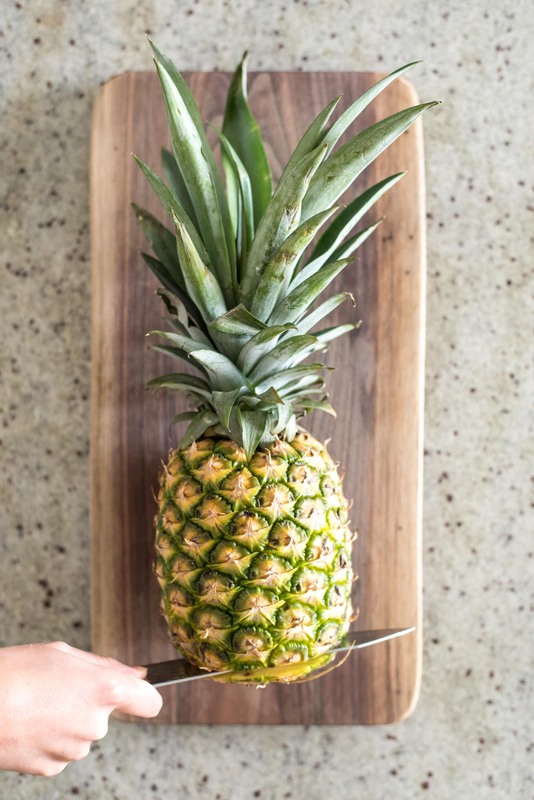 Store cut pineapple in an airtight container in the refrigerator. 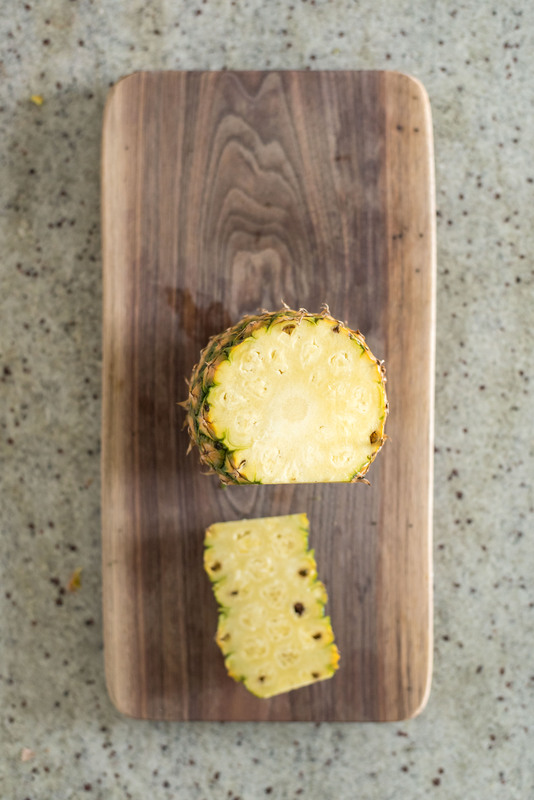 Pineapple freezes well. 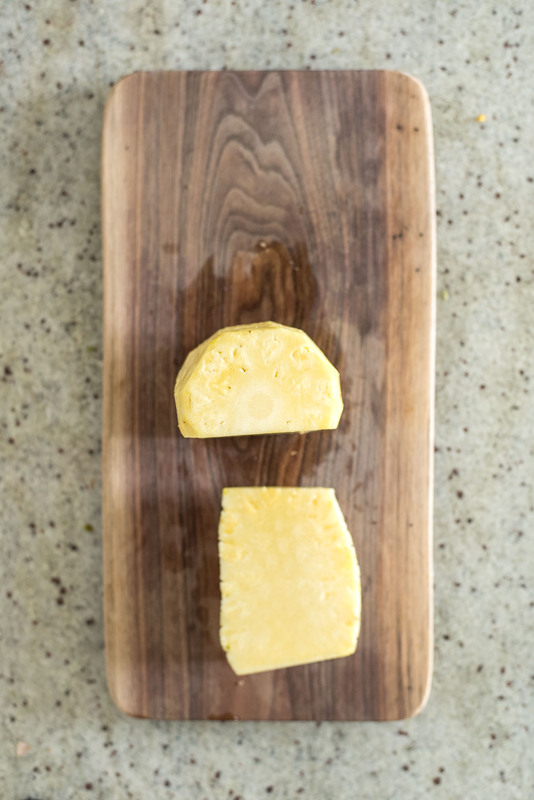 To avoid having a huge block of frozen pineapple, you can first freeze pieces on a sheet tray, then transfer to an airtight container. 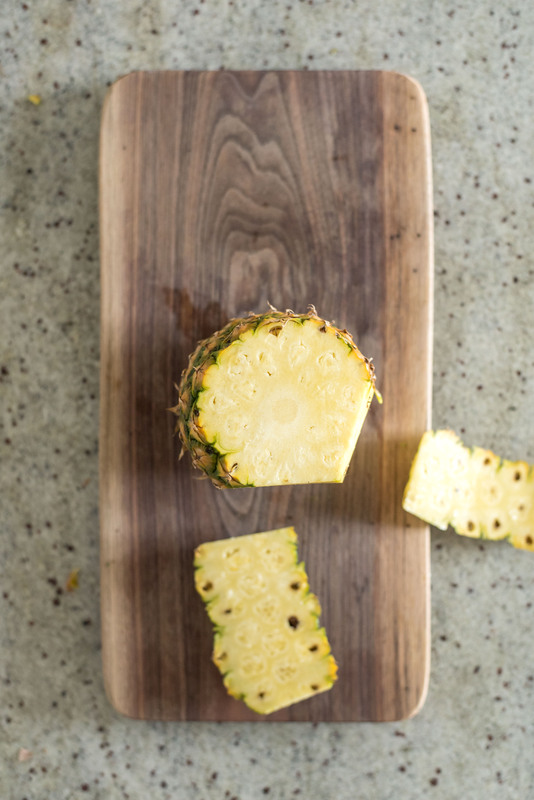 You can save the top for a decoration on a fruit platter. 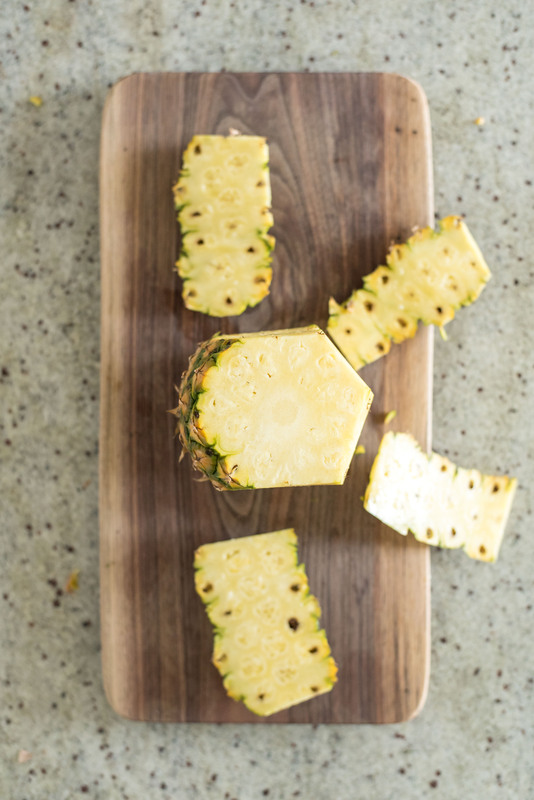 Simply set the top cut-side down on a serving dish and arrange fruit (or other food) around it. 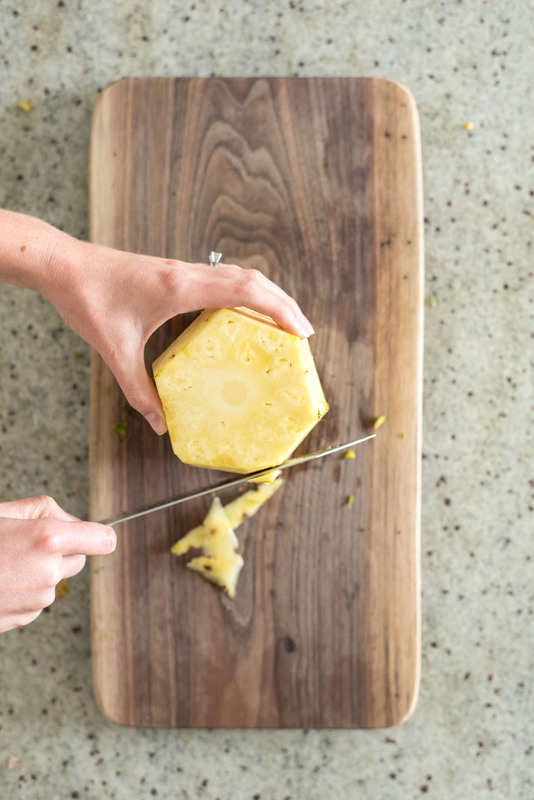 If you want whole rounds, follow the steps to remove the rind, then slice into rounds crosswise. You can use a cookie cutter to remove the core from each piece. *This page contains affiliate links, which means I earn a few cents if you make a purchase from these links. Thanks for helping support the projects that keep kenanhill.com in business! For more information, see my disclosures page.